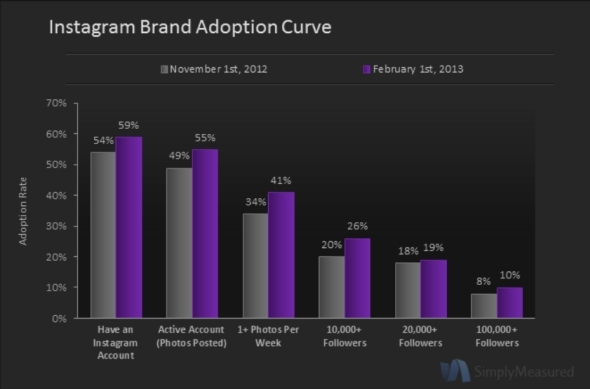 In the three-month period to February 1 2013, SimplyMeasured found Instagram’s use as an engagement tool by advertisers had risen by 5%. One draw for brands since November 1 2012 will have been the introduction of Web Profiles and Web Feeds. Instagram’s adoption by 59% of top 100 brands is within touching distance of Pinterest’s 69% and even the 70% managed by Google+. Twitter, on the other hand, found its quarter-on-quarter figures decline by a percentage point from 98% to 97%. The volume of brands active on Instagram through the posting of photos grew from 49% to 55% across the quarter that began on November 1 2012. 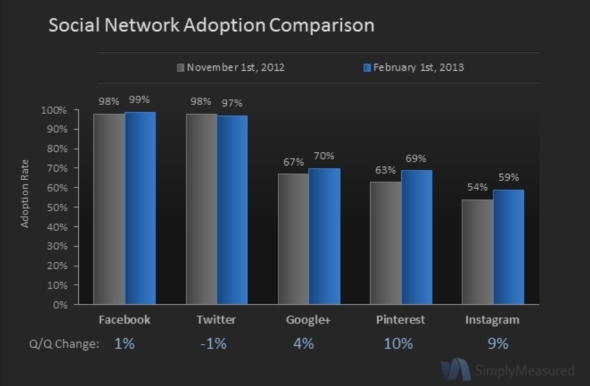 The gap to Pinterest shrank slightly, with the social pin board boasting 59% active brand accounts. Over a quarter of brands (26%) have upwards of 10,000 followers according to The Instagram Brand Adoption Study February, 2013. Further up the scale, 19% and 10% of brands have more than 20,000 and 100,000 followers respectively. MTV is currently the most successful brand on Instagram with 1.1 million followers. The music video broadcaster has seen 14% growth over the quarter, but a 12% drop in posts and 19% decline in engagement suggest MTV’s time at the top could be short lived.